Last weekend I discovered a new, and already much loved, concept in baked goods—the ‘brookie’. What is it? … Well, it’s the ultimate mash-up of brownies and cookies. 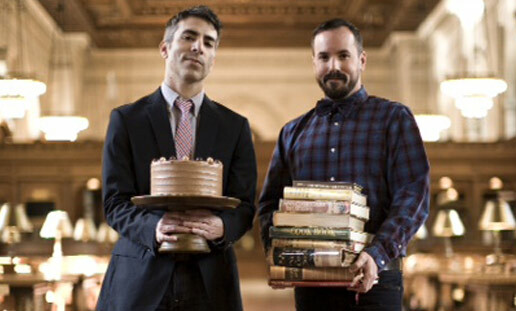 Credit for the brookie (also know as the brookster) goes to Matt Lewis and Renato Poliafito of Brooklyn’s Baked who took two simple recipes—brownies and cookies—and melded them together. It’s so simple, it’s genius. And the best part is, there are no set rules—you can mix and match recipes to your hearts content. You can make this recipe super quick and easy by using a brownie packet mix and also pre-made cookie dough, but given it was for my mates, I thought I’d get my Betty Crocker on and bake from scratch. Melt the chocolate in a bowl over a saucepan of simmering water, then set aside to cool. Beat together the butter and sugar until pale. Add vanilla and the eggs, one at a time, stirring until just combined. Sift the flour and cocoa, then fold into the egg mixture followed by the chocolate. In a separate bowl, beat butter and sugars until light and fluffy. Whisk in egg and vanilla. Stir in flour then fold through chocolate chips. Pour the brownie batter into mini cupcake tins that have been sprayed generously with cooking spray. Spoon 1 generous tsp of cookie dough into the centre of each filled cupcake tin, gently pressing down into the batter. Bake for 15-18 minutes or until cooked through.